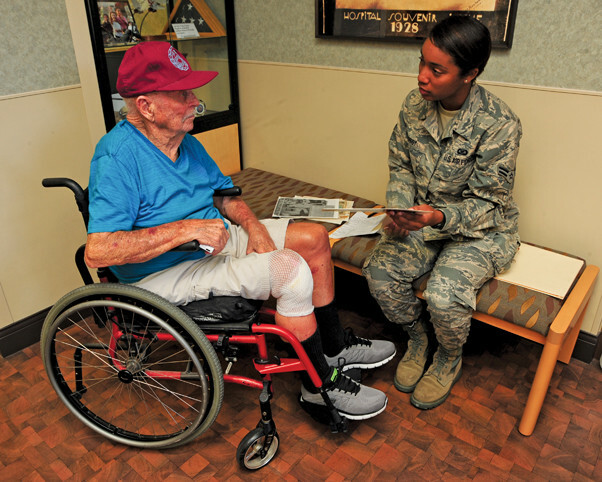 Malcolm Johnson, World War II veteran and former prisoner of war, shares stories of being interned during World War II with U.S. Air Force Airman 1st Class Mya Crosby, 355th Fighter Wing Public Affairs photojournalist, at the Tucson Veterans Center in Tucson, Ariz., Aug. 18, 2015. Johnson was a civilian contractor when he was captured in December 1941, then put into internment camps throughout China and Japan for nearly four years. TUSCON, Ariz., — Ninety-four-year-old Malcolm “Mickey” Johnson sits in his wheelchair wearing a maroon baseball cap with the words “Survivors of Wake Guam-Cavite” written in light blue letters. Johnson’s step-son and daughter-in-law sit attentively while he talks about his experience as a civilian prisoner of war. In April of 1941, Johnson was 19 years old when he traveled from his hometown of Spokane, Washington to Wake Island as a civilian contractor. Later that year in December, Johnson volunteered to fight alongside U.S. Marines against heavy Japanese forces during the Battle of Wake Island. Although his memory is fuzzy about his capture, Johnson remembered being wounded by bayonet and gunfire. Johnson was in Japan for a short time before being sent to an internment camp in Shanghai. He would spend the next 44 months in Japanese controlled camps throughout China and Japan. For the first two years of his captivity, Johnson was limited to light labor such as floor sweeping due to the severity of his wounds. Once Johnson recovered, he was able to move on to more physically demanding work. Though they worked long hours, the prisoners found ways to enjoy themselves. Johnson recalls playing softball games, card games, and even gambling. Johnson was able to write his first letter home May 30, 1942, five months after being captured. The prisoners also faced challenges while trying to acquire their mail. For some of those imprisoned, there was only one way to end the maltreatment from their captors. “I knew men that escaped,” Johnson said. “(There were) maybe about four or five of them. To Johnson, it seemed like the escapes ended in failure more often than not. Amid all of their hardships, malnutrition was just another to add to the list. Johnson said food was so high value that the other prisoners would gamble using their rations. Due to the living conditions, including the scarce amount of meat distributed to prisoners, and his previous injuries, Johnson’s weight was at an unhealthy level. Nearly four years after his capture, Johnson was finally released. He reflected on his long journey back to the U.S., making stops in places like Tokyo, Okinawa and Canada before finally arriving to his hometown. “Spokane felt like a whole new world,” Johnson said. On January 29, 1947, Johnson received a Bronze Star medal with Valor from the commanding officer of the Spokane Naval Supply Depot. Now a grandfather of 15, the civilian Bronze Star recipient resides in Kearny, Arizona.